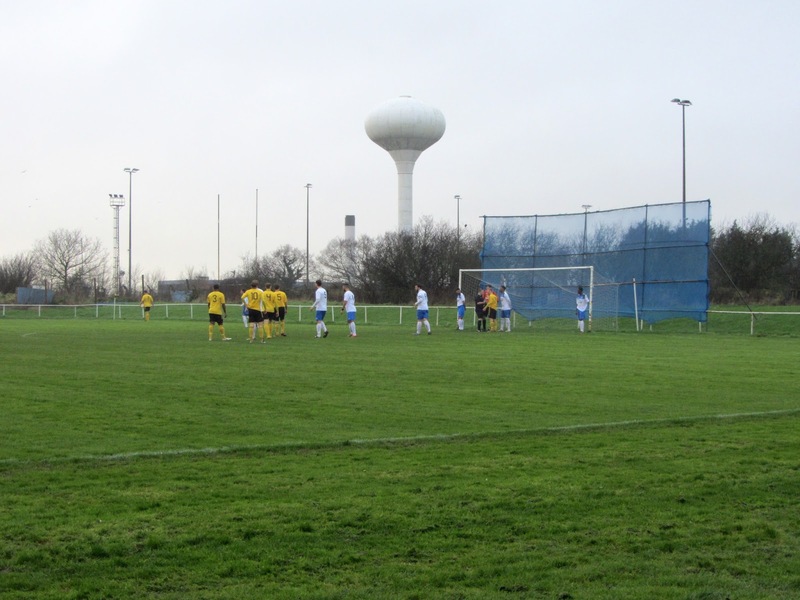 My first ground of 2016 was on Saturday 2nd January at Gardiners Close in Basildon, Essex. 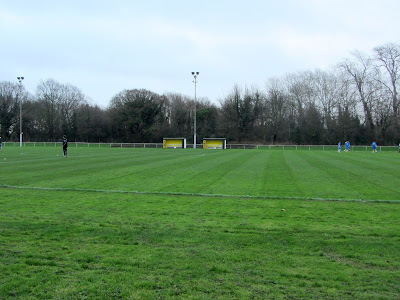 The match was Basildon United vs. Enfield 1893 in the Essex Senior League. 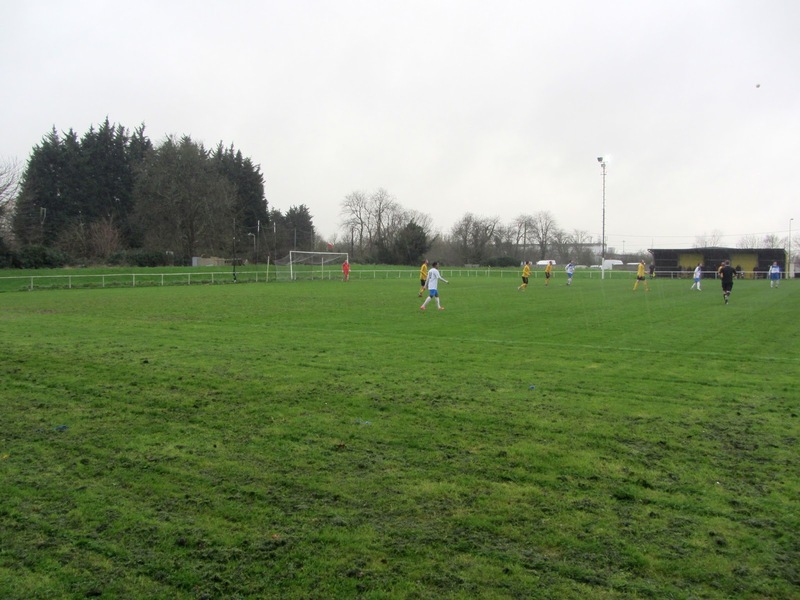 Gardiners Close is in the north of the town and is part of an area of green space which includes football pitches, cricket pitches and a leisure centre. The venue is 2.5 miles north-east of Basildon railway station and has been home to the club since 1970. All of the covered areas are positioned on the west side of Gardiners Close. There is an all-seater structure by the half-way line which has a total of 104 seats divided into two sections with the entrance to the players dressing rooms in between. Behind the dressing rooms is the club bar building located in the car park. There are covered hard standing areas either side of the all-seater stand with both of these having picnic benches acting as seating. The remainder of the ground is uncovered standing. 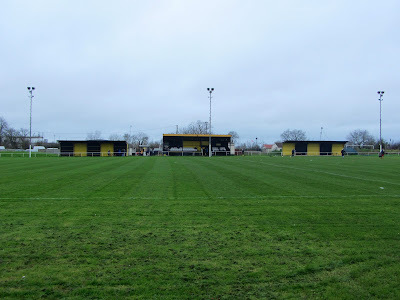 On the eastern side of Gardiners Close there is a section of concrete steps built into the grass bank but because of the location of the two dugouts in front of it you cannot actually view the game from here. Behind the northern and southern ends there are grass banks with gentle slopes. Netting is in place directly behind the two goals to catch any wayward shots. The game started with a spate of early goals as the players battled the wet conditions. 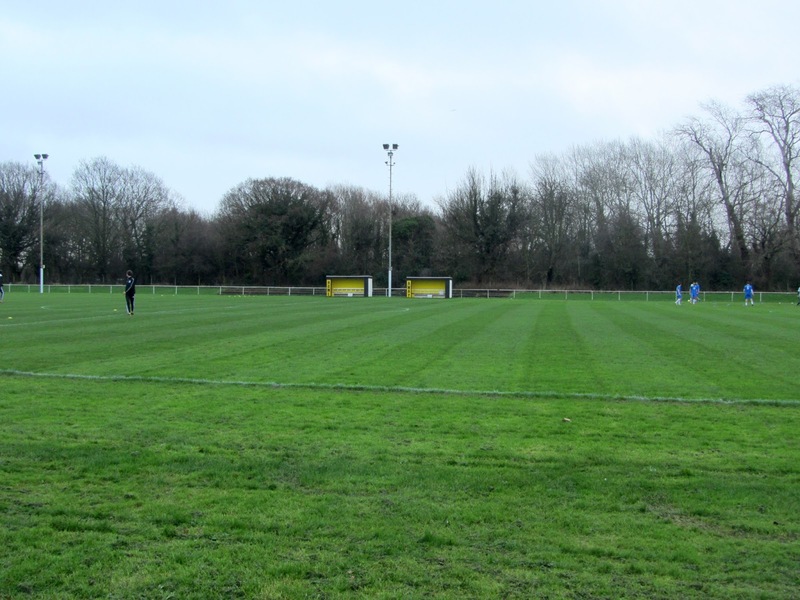 Enfield gifted the opener to Basildon in the 7th minute after goalkeeper Jordan Warren ran out of his area to clear the ball only to play it straight to Rob Clark who lobbed into the empty net from 40 yards out. The away side got back on level terms almost immediately though as George Whitelock was able to push into the box before his bobbled shot snuck past the Basildon keeper. The home side restored their lead in the 12th minute when a free-kick was drifted into the box and an unmarked #4 Callum Leahy headed in. Basildon began dominating after this and despite missing a couple of one-on-ones did manage to add a third in the 33rd minute when a cross from the left wing by Lindisipho Mtyanda managed to trickle into the bottom corner. In the 57th minute there was a scuffle involving several players and coaching staff which resulted in Enfield's Andre Spencer receiving his marching orders. With Enfield down to ten men Basildon stepped up their attack and notched their fourth goal in the 73rd minute as Brad Warner stroked in after being left one-on-one with the keeper. Warner then scored another in the 81st minute after he held off a defender before rounding the keeper and knocking it into an empty net. The hosts really should have added to this total but a couple of terrible misses in the final few minutes meant they were limited to five.